A large section of the SIE 598 Data Stream Management class is the final project, which takes up 1/3 of the class and runs in parallel to the more theoretical parts. 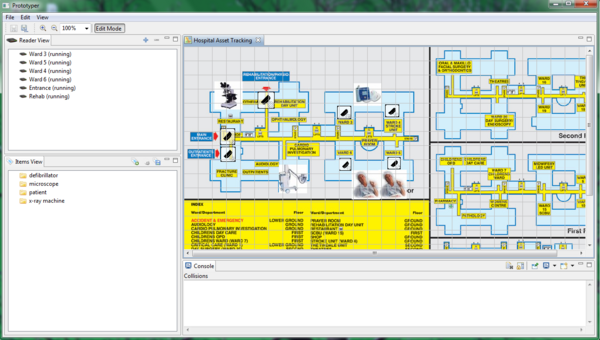 We decided to use a simulation environment to generate sensor data streams and selected Rifidi, an open source software using Eclipse and Esper that allows to build and simulate RFID environments such as warehouse management or equipment tracking in a hospital environment. For our final project, we assume that Umaine students’ black bear card (a card serving as ID and holding dining funds) is equipped with a RFID tag. Further, we assume that RFID readers are placed at all doors of the dining halls and around the dining areas, and students entering and leaving are tracked. We plan to use the simulated streams to answer simple stream queries such as “report average number of students in hilltop dining hall over the last 10 min” and other statistics.